What are the main Structural features of polymers? The term polymer simply means “ many mers”, where mer is the building block of the long-chain or network molecule. Fig. 1 shows how a long-chain structure results from the joining together of many monomers by chemical reaction. Fig. 1. Polymerization is the joining of individual monomers (e.g., vinyl chloride, C2H3Cl) to form a polymer [(C2H3Cl)n] consisting of many mers (again, C2H3Cl). l First polymer structure aspect – length of the polymeric molecule. Example: how large is n in (-C2H4-)n ? In general, n is termed the degree of polymerization and is also designated DP. It is usually determined from the measurement of physical properties, such as viscosity and light scattering. For typical commercial polymers, n can range from approximately 100 to 1000, but for a given polymer, the degree of polymerization represents an average. l Directly related to molecular length is molecular weight, which is simply the degree of polymerization (n) times the molecular weight of the individual mer. where l is the length of a single bond in the backbone of the hydrocarbon chain and m is the number of bonds. Eq. (1) results from the statistical analysis of a freely kinked linear chain as illustrated in Fig. 3. Fig. 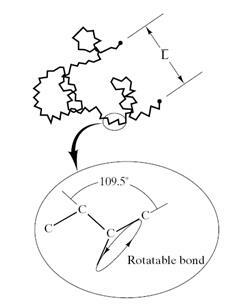 3 The length of kinked molecular chain is given by Equation (2), due to the free rotation of the C-C-C bond angle of 109.50. Each bond angle between three adjacent C atoms is near 109.5 0, but as seen in Fig. 3. this angle can be rotated freely in space. The result is the kinked and coiled molecular configuration. The root-mean-square length represents the effective length of the linear molecule as it would be present in the polymeric solid. were L ext is the extended length. The “sawtooth” geometry of the extended, molecule is illustrated in Fig. 4. Fig. 4. Sawtooth geometry of a fully extended molecule. The relative sizes of carbon and hydrogen atoms are shown in the polyethylene configuration. For typical bifunctional, linear polymers such as polyethelene and polyvinyl chloride, there are 2 bond lengths per mer, or m = 2n, where n is the degree of polymerization. 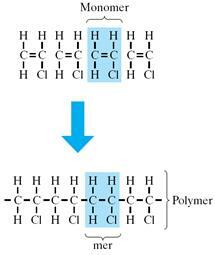 1) In general, the rigidity and melting point of polymers increase with the degree of polymerization. 2) BUT: the melting point of nylon does not change with degree of polymerization. Rigidity & melting point increase as the complexity of the molecular structure increases. Vulcanization – complete transition from linear to network structure is produced by cross-linking. Rubbers are the most common examples of cross-linking.